Home Fixtures & results News The 2015/16 Season is Officially Up and Running! For the most up to date Warriors news & scores, don’t forget to follow us on Facebook and Twitter! 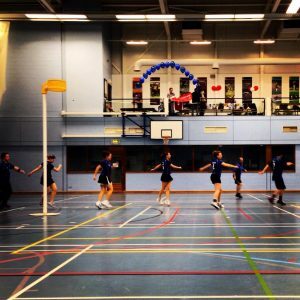 Warriors 1 already started their Central England Korfball League (CEKL) campaign last weekend with a win, and this week continue their CEKL fight as well as the start of the England Korfball Promo League campaign. Warriors 2 and 3 both launch their campaigns in the North West Korfball League this weekend. Can Warriors 2 remain undefeated for a second season in a row? Will Warriors 3 provide an upset to the 2’s? We fortunate this season to be support by a great pool of coaches with various levels of experience who are lead by original Warrior and long time Warrior Head Coach, Kev Moss. His very able assistants come in the form of: Ben Nickerson (following his move from Nottingham City and current injury status! ), Richard Dawson (‘Fish’ for all those who know him in the Korf World- 3rd Team Coach), Chris Cooper, Sophie Laurenson and Emma Higton. We are also fortunate to be able to draw on the fantastic experience of coaches and Warriors Veterans Mike Brayne and Paul Blood.